What I will describe below is not yet a problem but will appear when TeX Live 2019 is released and LuaTeX will be upgraded to 1.09. MikTeX users might already experience this issue. It also affects users of Mac OS X, because the random number generator of their C standard library is different from the one of glibc. When I typeset one of the graphdrawing examples from the TikZ manual, it appears mirrored between the LuaTeX versions 1.07 (TeX Live 2018) and 1.09 (TeX Live 2019). Why is that happening? The issue you are experiencing stems from the fact that the Lua version which is bundled with LuaTeX was upgraded. LuaTeX 1.07 uses Lua 5.2, whereas LuaTeX 1.09 uses Lua 5.3. This has some peculiar implications. 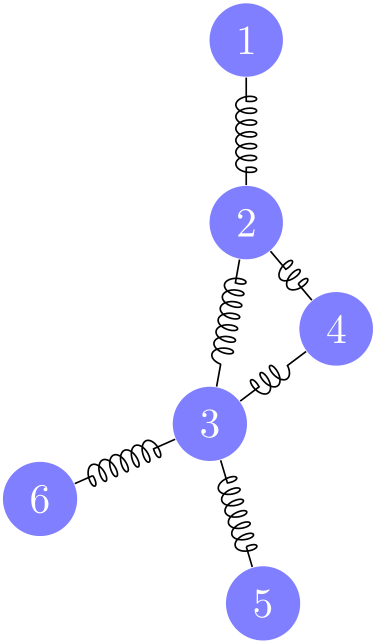 The force-based graphdrawing algorithms set up the vertices in a random configuration to start with. 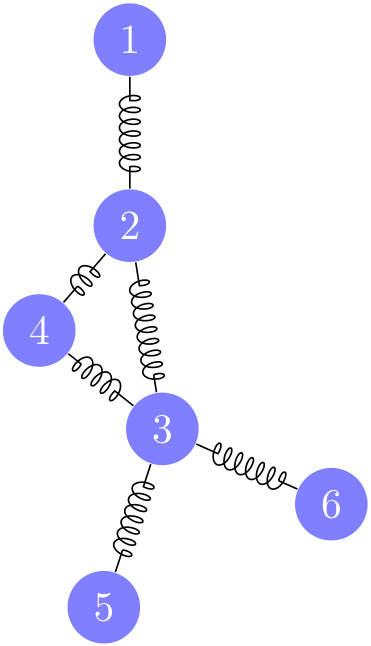 Then the system is annealed to find the optimal configuration of the nodes. To avoid getting stuck in a local minimum or at a saddle point, small random forces are added in each iteration. As you may have noticed in the previous paragraph, the word “random” appears a couple of times. That means that the algorithm is quite sensitive to the choice of random numbers. However, between versions 5.2 and 5.3, Lua changed its default random number generator (RNG). While Lua 5.2 used the C standard library rand() function, Lua 5.3 uses the POSIX random() function. Therefore you get entirely different random numbers even with the same seed. I believe this issue is localized to POSIX-compatible platforms, like Linux or Mac OS X. $ lua5.2 -e "math.randomseed(42); print(math.random())"
$ lua5.3 -e "math.randomseed(42); print(math.random())"
This does not mean that your graphs will be entirely different because the distribution of the random numbers stays the same (uniform distribution), only their sequence is different. That is also why the graphs still look so similar and only appear mirrored. Luckily this issue is entirely localized to the spring electrical layout, because no other graph drawing algorithm uses random numbers. Another option would be to reimplement the Lua 5.2 random number generator in Lua 5.3. This is of course not a good option and should be avoided, but in principle it is possible. The pure C and Lua implementations can be found in my GitHub Gist. This image will still not be exactly the same. The coil between 3 and 4 will have a different number of windings but I have no idea where this comes from. These might be artifacts of numerical imprecision due to Lua 5.3 introducing an integer datatype. Another alternative is to redefine the random number generator using the rand() and srand() functions by accessing them through the Foreign Function Interface (FFI). This however requires --shell-escape. To save some space I only present the chunk that would go in the luacode environment of the previous example instead. Then we can simply hook into the math.random function and twiddle the numbers like that. To save some space I only present the chunk that would go in the luacode environment of the first example instead. On my platform this actually works because in glibc, rand() is only an alias for random(), but I don't think this can be relied on, especially on the BSDs. Not the answer you're looking for? Browse other questions tagged tikz-pgf luatex or ask your own question.